When Daniel Doyle and Katelyn Selin of Charleston's Poogan's Porch set out to produce a refined take on banana pudding, they started by tinkering with a standard panna cotta recipe. 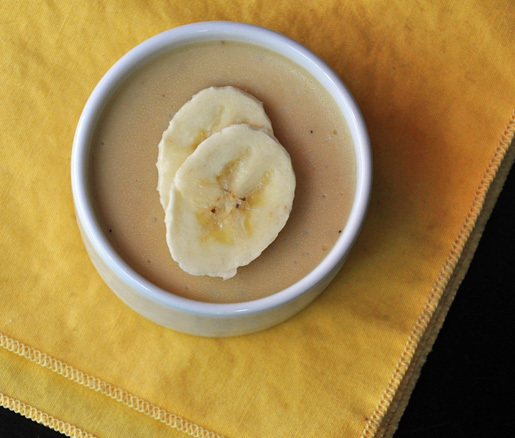 They boosted the richness of the base by adding cream cheese, then blended it with sliced bananas that were cooked in earthy brown sugar, butter, and bourbon. After several hours of chilling, the team completed their modern interpretation with garnishes of white chocolate foam and banana bread dust. At home, you can simply serve the pudding with vanilla wafer cookies or shortbread for your own version of this reimagined Southern favorite.